These Oakley brand gloves are on issue to UK military, having been designated an official NSN number now, and widely used in the later years of the afghan deployments. 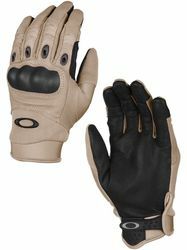 Made from premium leather with durable synthetic panels for flexible hand movement. Non slip palms, finger venting to keep hands cool, and carbon fibre knuckle protection. Recently released in new condition through MoD disposals, these are available in size XXL only, which in effect seems the same as a UK Extra Large, ie glove size 10 to 11. Retailing normally at over £40, heres your chance to grab a bargain!.